I seem best able to define my life by rivers. This is true across my family: we know ourselves best within the landscape of water moving downstream, traversing varied ecosystems, crashing through rocks, and pooling between cliff walls. Rivers make everything make sense. They are like a story line: moving clearly from one place to another, shifting in tone and personality throughout. One river must be given credit for this place of importance that rivers hold: the Dolores. The River of Sorrows. Flowing over two hundred miles from the Colorado San Juan Mountains to its confluence with the Colorado River north of Moab, the Dolores is a gentle, curving cut across the landscape, a transition from high alpine to redrock desert. Driving many of the roads through the region, like Highway 491 from Cortez to Monticello, you cannot tell there is an imposing canyon dropping down in the middle of the visible sage brush expanse. This small corner of Colorado remains surprisingly unvisited and unknown, but these canyons are in part where I grew up. The Dolores is where my father began his river outfitting company in the 70’s, offering multi-day trips across this remote landscape. As children in the summers, my brothers and I were sent out with our dad on the river. We were at ease in the sand, the wind, learning to row boats, read water, traverse slickrock streams, and pack up all the gear at the end of each trip. More than that, we learned to love rivers. There is one wind filled afternoon that always comes to mind when I think of my childhood summers. The water seemed to be working its way back upstream in small piled waves. The red sandstone cliffs appeared distant, beyond the haze of rain falling between us and them. There was that sense of portent that always accompanies storms gathering in the desert, as they slowly pick up momentum, holding everything in suspense and pulling the wind into their idea of what the day should be. The river felt wide. The grasses on shore began slowly to rustle and scratch at each other, drawing circles in the sand as they swung back and forth on their stalks. The wind strengthened and clouds pushed across the sky. Birds cast their black silhouettes into the river’s reflection. This was in the mid 90’s and I was eight years old. My older brother, ten only, had been given his own raft to row. I remember him looking so small at the oars, as the headwind intensified. He was wearing a red and yellow striped life jacket, and from my position I could see his slight body against the backdrop of the imposing sandstone cliff that rose at the next bend in the river. I had burrowed down into the footwell of the boat out of the wind. The desert felt vast and imposing, the distance to our destination, far. The wind was powerful and unpredictable. My brother fought to find purchase with his oars in the current. Within the intensity of the storm, despite worrying how we would make it to the take out, I was filled with wonder at the beauty, the adversity, and the wildness of the river corridor. 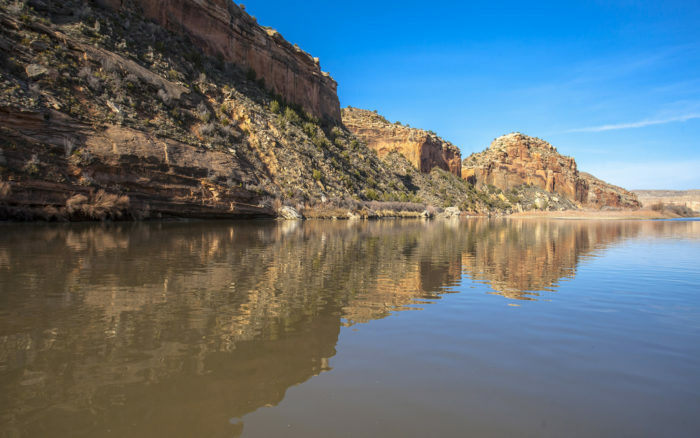 Until the unreliability of in-stream flow below McPhee Reservoir made commercially running the Dolores unfeasible, my family and I took clients and friends through its varied canyons, and shared our love of it with them. It was the best place to grow and learn to be a person. That time spent with rivers has seeped into the core of who I am and who all of my family members are. Today, two decades after the windy day on the lower Dolores, the life of my family still revolves around rivers. My brothers continue to guide in the Grand Canyon, and explore rivers worldwide through kayaking. One is pursuing a PhD in hydraulic engineering, while the other has been working as a salmon fisherman and recently finished working as on-river support for a remote BBC first descent in New Guinea. I am currently in a Masters of Fine Art program focusing on advocacy for rivers through creative work, running rivers across various continents to bring attention to the importance of water and rivers in various environmental, social, and political contexts. My parents still run rivers for the pure love of it. Everything, for us, comes back to water. Rivers, I find, make me feel the most alive of anything. This is in seeing the intensity of the life they gather around them and in the way the Dolores built me to be the person that I am. My love for wild places is reflected in the vibrancy water carries within itself, within its movement, and through the stories it spreads across landscapes.